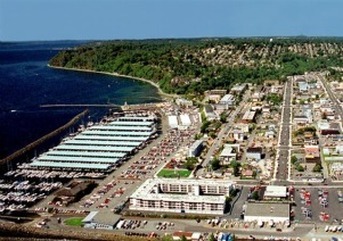 Our beautiful coastal city is located just 20 minutes south of Seattle, WA. We sit at the edge of the blue waters of Puget Sound, and are surrounded by the snowy peaks of the Olympic mountains and majestic Mt. Rainier. The dazzling Des Moines Marina is home to large sailing yachts, as well as small fishing boats for family fun. A delicious variety of fresh seafood restaurants, and boutique shopping, make up the downtown Marina district. Coordinates for our water-side entrance are: LA 47 degrees 24.106 N, L 122 degrees 20.8 W. Des Moines also owns and operates the Redondo Boat Launch, a concrete ramp launch a few miles to the south. If you are interested in permanent wet moorage, slip sizes range from 20-50 feet, and you can chose from open or covered slips. Upland, we have 105 dry sheds for boats up to 20 long. For your convenience, we maintain a waiting list for all permanent moorage slips and the upland storage facilities. Contact the Marina office for more information. Our fuel dock offers gasoline, diesel, propane, lubricants, potable water, and snacks. There is a free waste pump-out station at the fuel dock. Other amenities include shore power 30A, cable television, showers and restrooms. A privately-operated boat repair yard can handle virtually all of your maintenance and repair needs and a privately owned boat brokerage. The guest moorage area provides 1,500 feet of dock space for you and all your friends. Vessels up to 100 feet in length are welcome. Presently all guest moorage is available on a first-come basis, however, if your vessel is 32 feet or longer or if you have a group of 5 or more boats we will take reservations. A minimum of 1 week notice required in advance. When arriving, check in at the fuel dock near the marina entrance. All City of Des Moines Marina rates and fees are subject to change without notice. ​Des Moines is in Marine Area 11. For information regarding fishing regulations, licensing and seasonal species rules click on the following link; State of Washington Department of Fish and Wildlife. Marina Rules and Regulations are located in the Moorage section.